We’ve had feedback from a number of our customers over the years about how they use our bags and accessories as luggage while travelling. 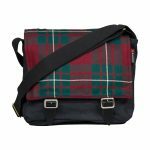 We thought it would be a great idea to pull it all together for a blog post about how you can travel with a bit of Scottish style. First off, we have our two pieces that were primarily designed as luggage – the Arisaig weekender and the Comrie overnight bag. 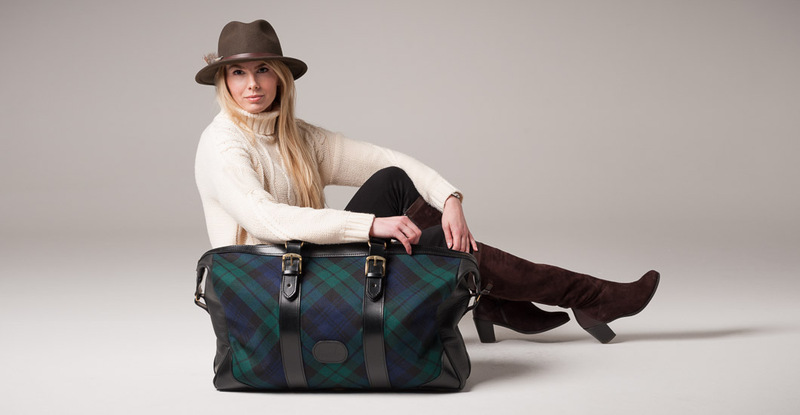 The Arisaig is the biggest piece in the Dunmore Scotland range and it is a stunning piece of luxury luggage that will stand out from the crowd on the luggage belt. 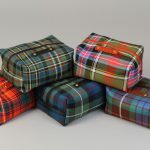 Named after a beautiful destination in Scotland, choose from fabric or leather options, both of which are made – like all Dunmore Scotland pieces – right here in Scotland. We’ve spotted an Oscar-winner with the green leather version, a gladiator with good taste clearly! The Comrie is what we term an overnight bag, smaller than the Arisaig, it is a soft leather hold-all that will carry everything you need for an overnight stop. 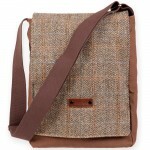 Soft brown leather exterior hides an interior lined with Holland & Sherry merino wool tweed, with pockets for small items. 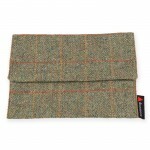 Every traveller needs a wash bag and we have two options. 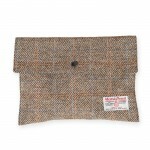 A Harris Tweed pouch is perfect for overnight trips or we also have a zipped wash bag available in tartan or Harris Tweed. 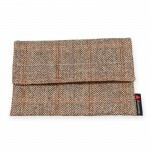 Everyone travels with phone and tablet these days and we have Harris Tweed and tartan iPad covers. 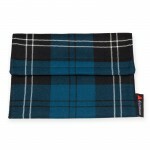 Each of these are fleece lined to protect your device from scratches and they close securely with Velcro to keep you device safely inside as required. We also have a small stock of leather phone covers available. 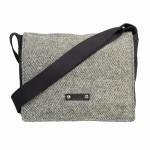 We had a lady customer who bought one of the ‘large’ unisex satchels with a clear vision in mind – she was going travelling and wanted a large bag with pockets that was secure, could carry everything she needed while in transit, let her keep her hands free and – importantly – was stylish too. Our satchel fitted the bill perfectly and we were delighted. 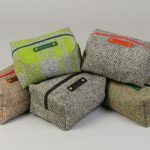 We think she’s right, each of our satchel choices are a perfect travel bag – worn cross body your hands are free to check directions on a phone or map and the secure Velcro or buckle fastenings keep your possessions secure. What more could you ask for?